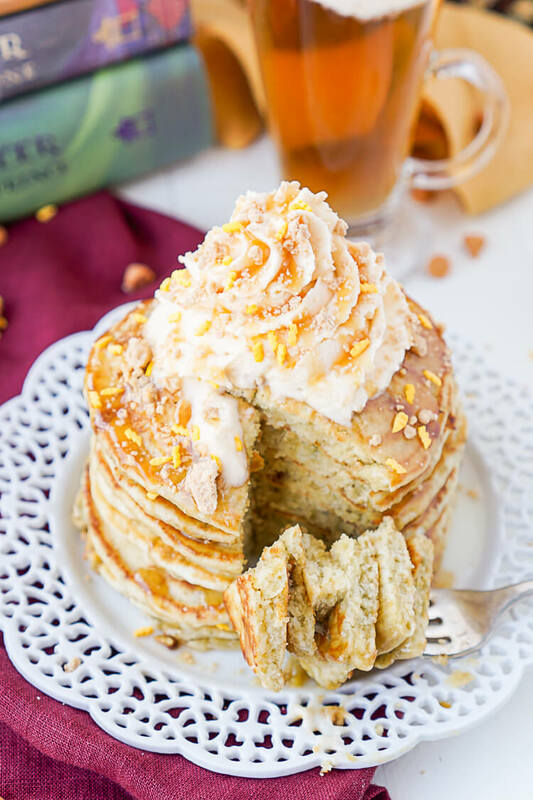 These Harry Potter Butterbeer Pancakes are loaded with caramel, butterscotch, vanilla, and butter flavor and the perfect nerdy start to your day or a great way to kick off The Chosen One’s birthday! You guys! 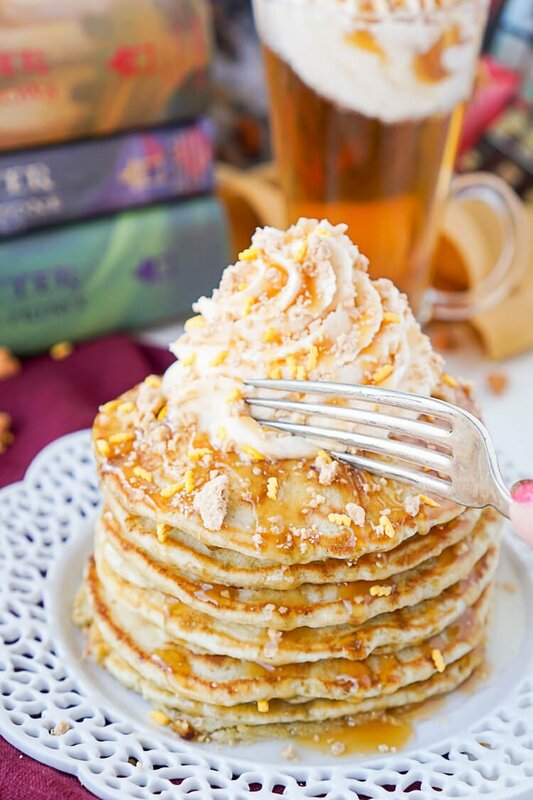 BUTTERBEER PANCAKES! I mean, I don’t know about you, but I can’t think of a better way to start the day. 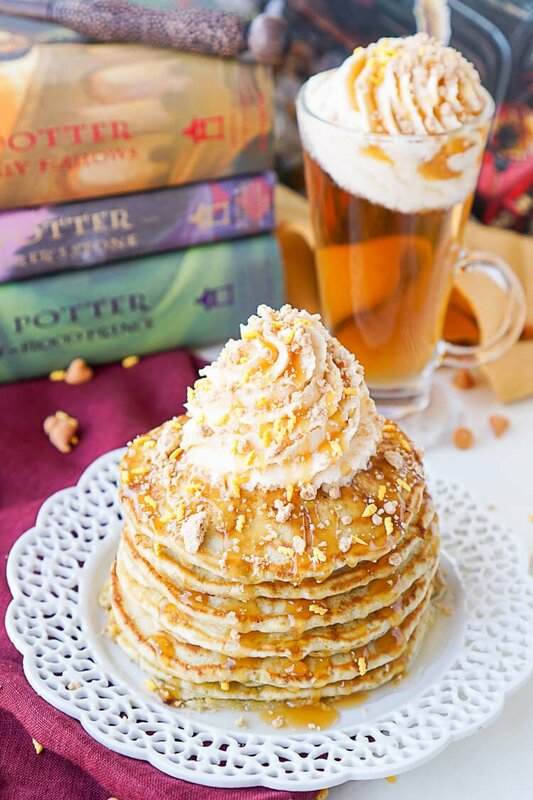 Seriously, Butterbeer freakin’ pancakes! It only took about four batches to get them right, but it was so so worth it! Is anyone else excited about the release of Harry Potter and the Cursed Child, both the play and the written screenplay? I’ve been trying to convince my husband to go to London for weeks now, it hasn’t happened yet, but I can promise you, IT WILL – someday! But in the meantime, I’m really excited for the book adaptation to come out this weekend! Also, have you seen the Illustrated versions? They’re so gorgeous and it’s been fun having a new set of some of my favorite books to collect! And have you seen the new 20th Anniversary copy of Harry Potter and the Philosopher’s Stone, it was only made available in the UK, but you can order it on Amazon through the link below! You can buy them in both hardcover and paperback with your house, I got the Ravenclaw one and it is bloody beautiful! Harry Potter and the Prisoner of Azkaban: The Illustrated Edition!Buy Now! Harry Potter and the Philosopher’s Stone: 20th Anniversary Edition!Buy Now! 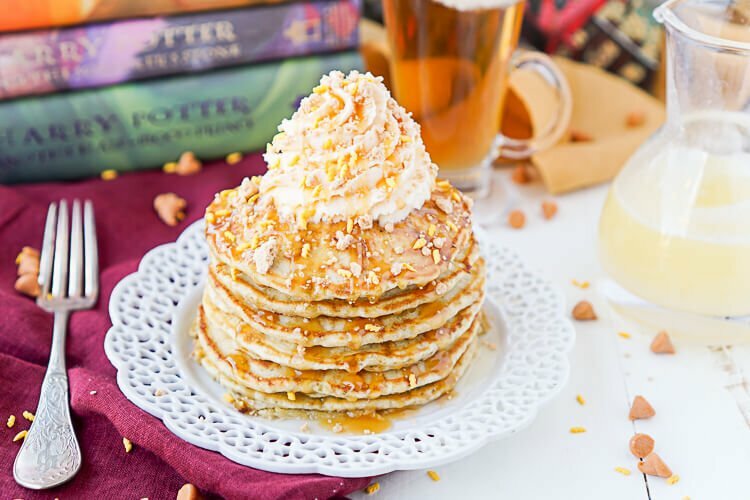 These pancakes are made with a mix of butterscotch, caramel, vanilla, and butter to give that rich and delicious butterbeer taste we all know and love! They’re also made with ricotta cheese to keep them soft and fluffy. And then they’re topped with the most incredible butter syrup, like no joke, this stuff is amazing! You might be thinking – butter syrup, why not just add a couple squares of butter and let them melt over the pancakes like muggles do – well, because this is no ordinary syrup! This syrup is made with butter, buttermilk, butter extract, sugar, and baking soda and it’s out-of-this-wizarding-world-good! These pancakes just wouldn’t be the same without it! This syrup is basically a buttery sugary drizzle that tastes like every freshly baked, warm pastry you’ve ever had. It’s absolutely heavenly. 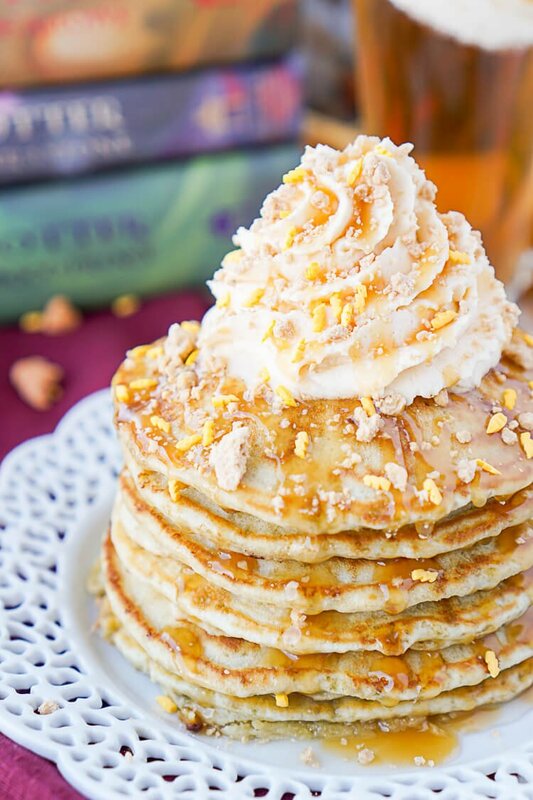 So stack those pancakes up, pour that amazing syrup all over them and top them off with a fluffy butterscotch whipped cream! Don’t forget to drizzle them with butterscotch or caramel syrup (or both) and you can’t leave out the Lightning Bolt Sprinkles! 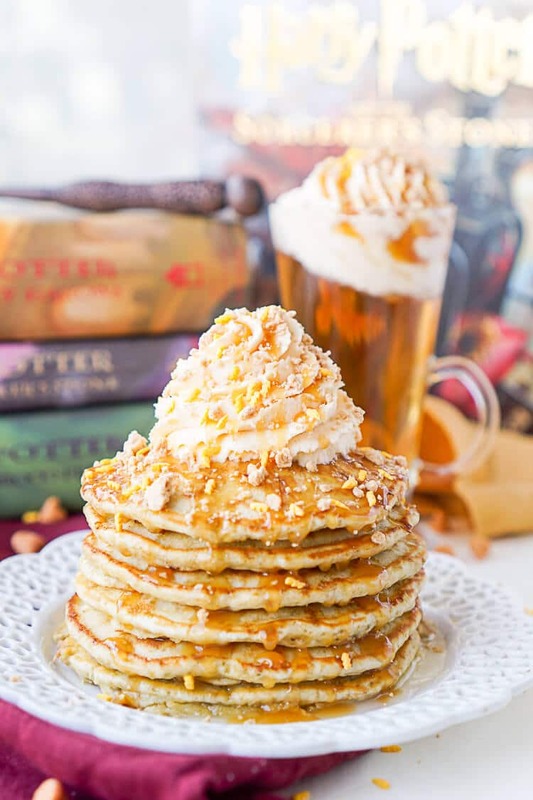 Several have asked and since much of the butterbeer inspired flavor comes from the whipped cream and the syrup, you can use a regular pancakes mix or your own pancake recipe and just add the butterscotch chips to them and add the additional toppings. 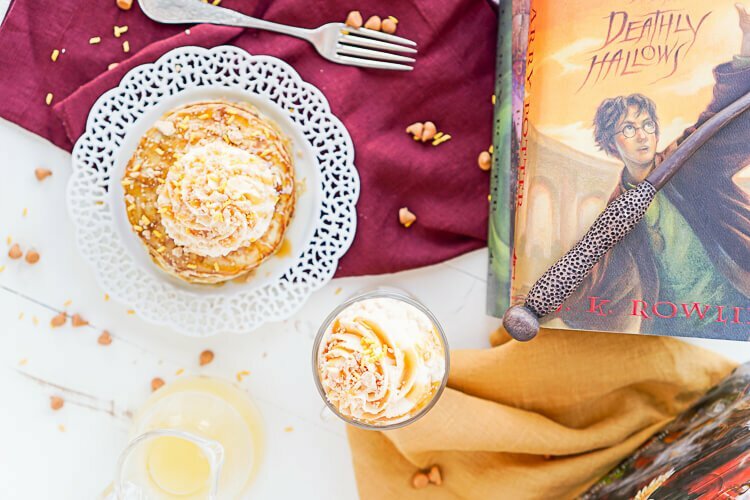 If you’re a Harry Potter fan (and who isn’t) you may also love these other recipes! 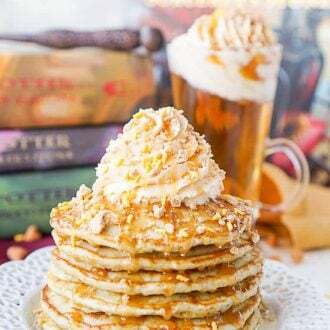 Watch How To Make Butterbeer Pancakes in the Video Below! Add butterscotch chips to a food processor or blender and pulse until fine bits form. In a large bowl, not a stand mixer, combine flour, sugar, baking powder, baking soda, salt and and butterscotch chip crumbs. In a separate bowl, whisk together milk, ricotta, coffee creamer, and eggs. Add wet ingredients to dry ingredients and stir until just combined. The batter should be a bit lumpy, do not overmix. Spray griddle or large pan with cooking spray and heat over medium heat. Use a ½ cup measuring cup to measure and pour batter onto cooking surface. Cook for 1 ½ - 2 minutes until edges start to bubble, flip and cook the other side for about a minute until that side is golden brown. While pancakes are cooking, add butter, buttermilk, and sugar to a medium saucepan. Stir together on medium heat until sugar has dissolved and butter has melted. Let ingredients come to a boil and boil for one minute and remove from heat. Stir in baking soda and butter extract, syrup will have a bubbly foam on the top, this is normal. Let rest for a few minutes and your syrup is ready to serve. Whip all ingredients in a medium bowl or stand mixer fitted with a whisk attachment until light and fluffy. Top your stack of pancakes with the butter syrup, butterscotch whipped cream, and optional toppings. 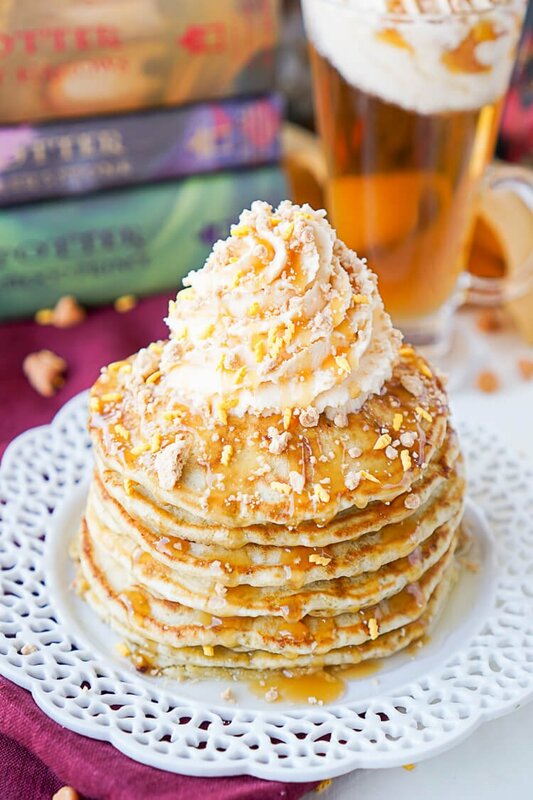 Pin these Butterbeer Pancakes for Later! Is it unsalted butter? I mean I’m assuming it is but I wanted to make sure. In the syrup? It can be either.